(Phys.org)—Photographic film maker Fujifilm has been busy this year at the Nanotech 2013 conference being held in Tokyo. First came news of bendable/roll up speakers. Now the company is showing off a new thermoelectric material it's developed that is so sensitive it can covert a difference in temperature of just 1°C to several kilowatts of electricity. At the conference, Fujifilm showed a person pressing their hand against a device that caused a toy car to begin circling around a track. It's based on a thermoelectric material, representatives from the company told attendees that has the highest conversation efficiency of any other such material. Thermoelectric materials work by taking advantage of the temperature differences that exist on either side of a given substance. At the demonstration, the temperature difference is found between the heat from a human hand and the surrounding environment. In such materials, an electric charge can be created if a way is found to take advantage of the temperature gradient that exists in the material, i.e. causing charge carriers in it to diffuse from the warm side to the cooler side. The electricity produced from a thermoelectric material can be used to power a small device, or sent to a battery for storage. In addition to breaking the record for efficiency conversion, the new material is also an organic conductive polymer —and it can also be manufactured using a printing process. That means it can be produced in virtually any size needed. 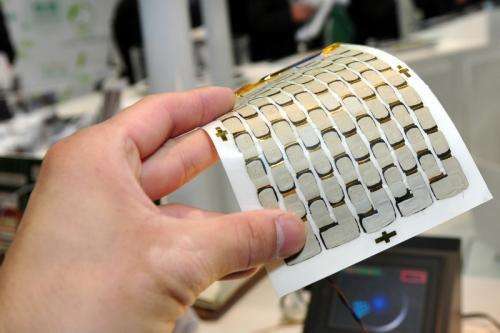 And because it is also bendable, it can be used as part of a wrapping apparatus, making it suitable for skin applications, such as a power generator for medical devices. Representatives for Fujifilm said it could also be used with solar cells to help make them more efficient, though they declined to give any other details regarding how the material was made. They added that another announcement will be forthcoming at the 60th JSAP Spring Meeting in March. What's perhaps most exciting about the new material, is that it might be leading the way towards wearable materials that take advantage of our body heat, to power our personal devices—relieving us finally from the burden of having to constantly worry about making sure to recharge them. "Though Fujifilm has not disclosed the details of the new organic material"
Sad, because it's the numbers that make us happy. It must take significant effort to write such a content free press release. The reason is clear. FujiFilm wants to promote it's company, but doesn't have anything significant to promote. So promote anything and leave out the details so that it won't be so obvious that the promotion is unworthy. People should pick up loads of discharged batteries at gas stations & drop charged ones at any designated locations on their way (for some one to pick them & use IN BULK. The computer should make a count of them and send out Checks at the end of the Year....Big surprise for April_Pool Day! So let me get this straight. FujiFilm has this new thing that uses far better technology to do something. The repercussions could be significant to non specific areas of our lives. Everyone should be excited about this because based on wild speculation that isn't grounded in any form of reality this product is going to completely change our lives. To make you think you are getting actual information I am going to use the measurement of 1 degree centigrade producing gigawatts of electricity in such a non specific way that it is actually impossible to tell if this is good or bad. I feel more intelligent now New Scientist. We need a new term to describe this type of article. It should be based on Latin and should combine content with void of meaning. Then again we could just call it a press release and everyone would understand what is meant. milliwatts, kilowats, what's the difference? They're both a factor of 1000 away from a watt, after all. So, scaling up things, you could drive anywhere for free just by coating you car with this stuff and asking people to touch your vehicle on your way to your destination. But it is unlikely that even a caption writer would make that mistake. The 'o' is right next to the 'i' on a QWERTY keyboard, so it is easy to type millowatts instead of milliwatts. I tried three spellcheckers on millowatts. One had kilowatts as the first suggestion and milliwatts farther down on the list, another had kilowatts first and didn't have milliwatts at all, and the third had kilowatts as the ONLY suggestion. A good editor should catch kilowatts as a probable error, check out the original article, and fix the mistake.